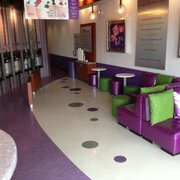 CUPS, a self-serve yogurt store chose Bomanite Micro-Top for its ability to provide custom colors and graphics that matched the cool vibe of the beach-themed store. CUPS provides a guest experience that is very different from the normal yogurt bar or ice cream shop. Dance music with lighting and murals provide a club-like experience with an edgy vibe that draws crowds and celebrities. 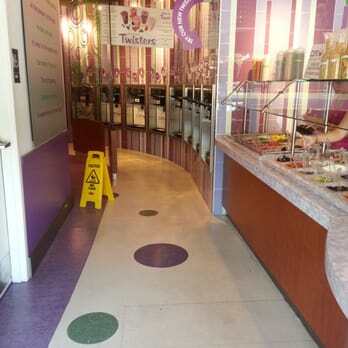 In order to create a cool and inviting space, Bomanite Licensee Beyond Concrete, had to first remove the extensive existing glue and surface and do some much needed crack patching for the current retail space. Once the Bomanite Micro-Top overlay was in place Bomanite Hydrocoat sealer and Bomanite Interior Floor Finish were applied to provide the low-maintenance and protection needed for the day to day foot traffic. Micro-Top by Bomanite, a is a cutting-edge technology, that uses a paper-thin concrete medium, that provides a coloration system like no other. 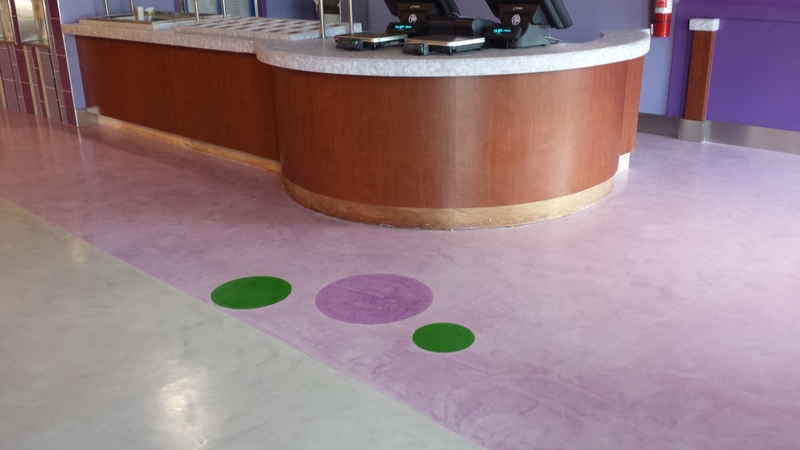 A troweled-on cementitious topping that tenaciously bonds to virtually any substrate provides a canvas where works of art are graphically produced, utilizing custom logos, unlimited graphics, swirls of color or marbleized hues to reach the perfect color combination. Bomanite Micro-Top has the ability to transform damaged concrete or an expanse of plain, gray concrete into a distinctive and dynamic area, bringing bold colors and designs where they’ve never been before. Micro-Top is an ideal replacement for carpeting or laminate flooring as no costly blasting is necessary before application-resulting in significant savings of time and money and making it perfect for a retail makeover.